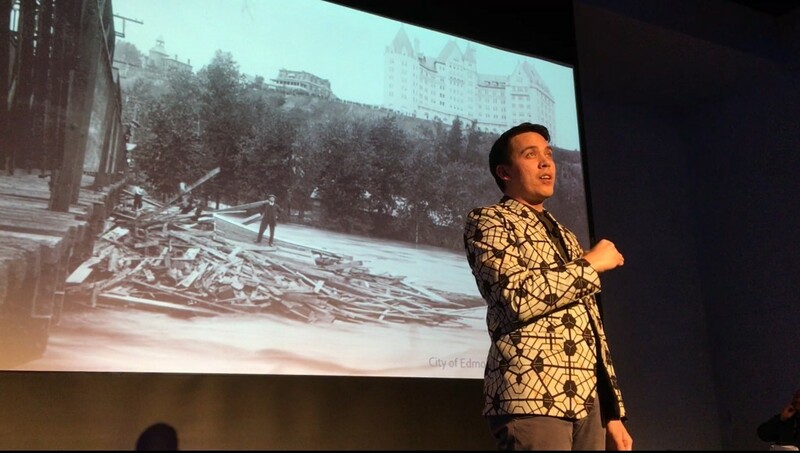 As the deadline for nominations for the next – and fifth – Historian Laureate approaches, we caught up with outgoing Historian Laureate, Chris Chang-Yen Phillips, to reflect on his term as Edmonton’s official ambassador for all things historical. Chris was appointed the City’s fourth Historian Laureate in 2016, succeeding Danielle Metcalfe-Chenail. Your appointment as Historian Laureate was a bit of a departure from previous Historians Laureate in the program. What was it like for you stepping into the role of Historian Laureate? I was honestly a bit intimidated. I definitely experienced imposter syndrome and kept waiting for someone to tap me on the shoulder and say “actually just joking, we’re going to put this other person instead who actually has a history degree.” Once I met the Edmonton Historical Board and folks from the Edmonton Heritage Council and saw how much support there was, I definitely felt more relaxed. Did you feel like there were big shoes to fill in terms of keeping up with the track record of work produced? What were some of the highlights for you during your term as Historian Laureate? 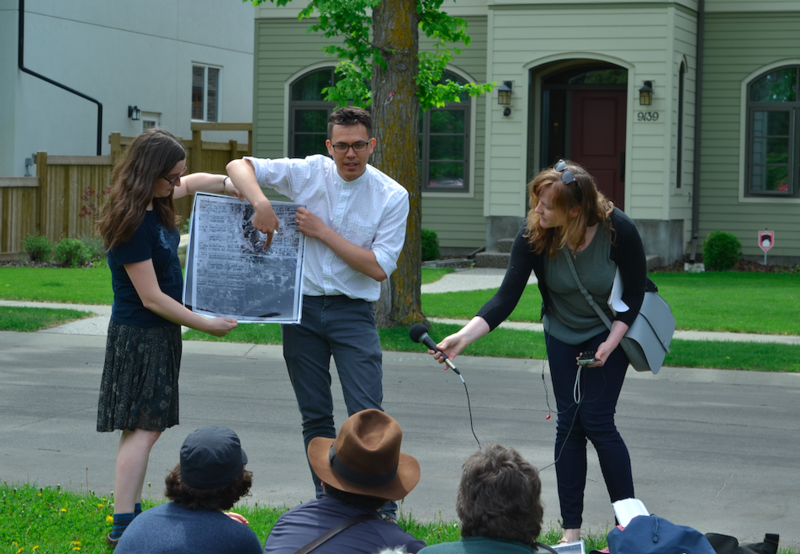 The moment when I felt the podcast had really found its place was when we did the episode about the Ku Klux Klan presence in Edmonton. I was excited about it from the perspective of feeling glad to be able to expose that there has been a shameful white supremacist history to learn about here in Edmonton, but I was also excited that lots of people felt like this was a conversation worth having – asking how we remember ugly parts of history that we aren’t even past yet. When we released that episode and CBC got interested and we got lots of feedback from listeners, and a couple course instructors at the U of A and MacEwan let me know that they were teaching that podcast in their classrooms, that was pretty exciting. What has been the most memorable project or story to explore? So far, I’d say it’s been learning about the history of the Ku Klux Klan and white supremacist movement in Edmonton, and learning that they weren’t fringe movements. The Klan had express written support from Edmonton’s mayor at one point. It was pretty stark to learn that this wasn’t an abstract issue and how many Edmontonians live with the legacy of white supremacy all the time. It was just really sobering to see evidence in our hands of the City of Edmonton lending official support to those movements. You took a different approach to your time as Historian Laureate. Why did you settle on a podcast? Part of it is just that’s what I’m good at, and part of it is that I felt like Edmonton needed more storytelling of our own stories, and in a way that is fun and accessible. I did some research on the kinds of projects that other historians laureate had taken on and I knew that they had explored published writing and public presentations. I knew that podcasts also reach a slightly different demographic, particularly a slightly younger audience that doesn’t always tune into broadcast radio or pick up written materials. I felt like it was a way to potentially reach out to people who would be interested in Edmonton’s history if it was presented to them in a new way. Was there any time you felt particularly challenged by the content you were exploring? It’s tough sometimes wanting to shine a light on stories that I know are not my own. I also knew that I wanted to take this podcast and use it as a platform to tell stories about cultural communities that don’t get a lot of attention in our city’s official narratives: Indigenous communities, for example. We did an episode where someone who’s from a settler background asked the history of how Indigenous people in this area have grown food plants and what food plants have been important to them. I wanted to intentionally use that as an example of how we can respectfully ask questions across cultures. Making that episode of the podcast was a very challenging experience. It wasn’t like opening a book and just collecting the information in there and using it however we wanted. A big part of the process was learning about how different Indigenous cultures see information transmission, who gets access to that information and what responsibilities come along with that. 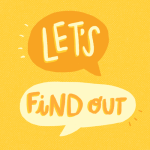 Was there any story that you feel you missed out on exploring in your time as Historian Laureate? Hmm – hundreds. Somebody approached me with this memory of going to The Bay downtown as a kid in the 50s and going to see a Christmas train on the roof of The Bay building. I thought it was very interesting, but there hasn’t been an opportunity to dig into it. I would love to learn more about that. We’re going to continue doing the podcast even after the formal role ends, so there may be time to dig into some of those. That’s partly why we just joined to the Alberta Podcast Network which will help cover the costs of hosting and put us in a community of other podcasters. What do you hope to see for the program going forward, and the next Historian Laureate? I wish that each Historian Laureate had more time. Not a longer term, but I wish they more time within their term to spend on projects because there is so much to learn and do in this city. It’s been a really fun experience. What I hope for them is that they embrace their own strengths and curiosity, and leverage that to help other Edmontonians get curious about those aspects of Edmonton’s history. I think this role is stronger with each Historian Laureate bringing their own personality and background to the work. I kind of see it like Doctor Who. It’s sad when each Doctor regenerates, but I’m always excited to see what the next Doctor brings to the table. Do you have any final advice for the next Historian Laureate? Take advantage of the fact that there are a ton of people already doing this kind of work in Edmonton. Almost any topic that I’ve been curious about, there’s already a person or group in Edmonton doing research on it, or hosting storytelling nights, or writing books about it. So, take advantage of fact that there are Edmontonians just waiting to get excited about your work and share knowledge. The City of Edmonton Historian Laureate Program launched in 2010 with the goal of promoting the history of the city and its citizens by documenting, researching, interpreting and sharing stories of the people, places and events that have created Edmonton’s distinctive heritage and character. The fifth Historian Laureate will be announced in April 2018. To learn more about the stories Chris Chang-Yen Phillips has explored during his term as Historian Laureate, and to catch up on all the past episodes of the Let’s Find Out podcast, please visit visit the podcast website.